Cu-Sil® partial dentures are designed to provide a long-lasting, soft, cushioning effect to help preserve your remaining natural teeth. It is extremely important that this premium partial denture be properly cared for, and proper cleaning and care are integral components to the life and longevity of Cu-Sil® partials. The use of Cu-Sil® cleanser is highly recommended because it is an important deterrent to the potential invasion of black Candida fungus(1) which is not only unsightly, but cannot be removed. It is a moderate strength, non-chlorine product that will not cause bleaching, hardening, or porosity of the soft elastomeric material, and will preserve and protect the Cu-Sil® denture. 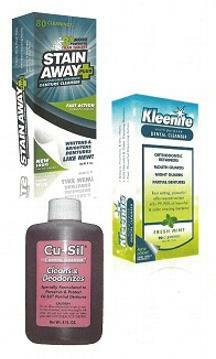 Stain Away Plus® and Kleenite® can also be safely used. Kleenite® will remove stains and plaque, while occasional use of Stain Away Plus® will remove hardened calculus and tartar. Denture tablets should not be used, as they can cause serious damage in a matter of a few months. In clinical tests by the Mayo Clinic, Cu-Sil® Cleanser was found effective against all eight strains of Candida Fungus, while preserving the usefulness of soft Cu-Sil® linings.